Get the closet storage space of your dreams with a few easy steps and a sturdy, simple DIY shelving system. Have you dreamed about a walk-in closet with endless storage possibilities for clothes and accessories? Fortunately, virtually any spare space—from an underused home office to a small bedroom sitting vacant now that the kids have grown up and left the nest—can be transformed to efficiently contain almost everything you own, all without having to hire a pricey pro or deal with messy construction. Just turn to the Walk-In Closet Organizer, a modular storage solution from EZ Shelf. It’s a sturdy, user-friendly system that will let you create a wardrobe that wows in just about an hour. Made of high-strength expandable steel tubing, each shelf can hold up to 200 pounds (in only ½” drywall) and can be installed anywhere—securing to wall studs are NOT required for all that weight. Read on to learn how you can create a fully functional walk-in closet space. Then, grab a few basic tools, and seven short steps later, you’ll be using the time and money you saved to fill your closet up with great new clothes! Step 1: Clear out and measure up. Empty the room of its current contents, sorting as you go. Consolidate what you’re sure you’ll use, donate anything else that’s “perfectly good” but of no use to you, and toss the rest. Vacuum or sweep the space well. Once you’ve got a blank slate, measure the room to get a sense of the area you’ve got to work with. Available in either white or silver to suit your style, the Walk-In Closet Kit adapts to fit a space of any size or shape by offering five shelf-and-rod units that can be mounted in one of two ways: extended between two side walls or attached to the wall via a bracket. Plus, each shelf expands from 40 inches to 73 inches—altogether, that’s almost 30.5 feet for storing boxes or hanging garments—and you can squeeze the shelves into a narrow space or fill a long wall. Step 2: Find your flow. 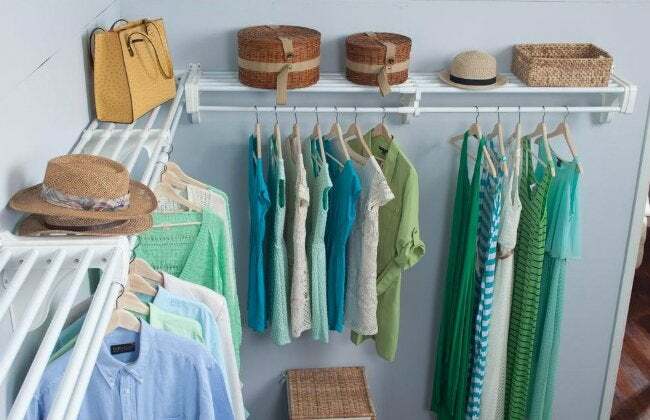 Plan the placement of the contents of your closet in a way that will best suit your needs and lifestyle. Group all like items together: shirts with shirts, pants with pants, and so on. Chances are there are certain go-to items you wear or use often, so you’ll want them to be accessible most easily and on a completely separate rod. Keep to the rule of thumb most professional stylists and closet experts recommend: If you can’t see it, you won’t wear it. The beauty of this DIY closet system is that it allows you to put items on shelves and hang them on racks, rather than dig through drawers and opaque bins. Everything remains organized and in view. Step 3: Install sidewall shelving. Consider mounting at least one expandable closet shelf with an accompanying bar to run the full length. Use the tape measure to find and mark the exact height of the shelf that you want to extend between the two sidewalls. Typically, for a double hang area, you’d position the lower shelf and rod 40 to 42 inches high (from the floor to the top of its rod) and the top shelf and rod combo 80 to 84 inches high (from the floor to the top of its rod). Then, punch out the template that comes with the kit, tape it to the wall, and use a level to ensure that your shelf surface will be level. Mark the anchor placements on each sidewall in pencil. Using four high-strength anchors and an electric drill/screwdriver, install the first tube receiver to the left sidewall and check its positioning with a level. Insert one expandable, high-strength steel tube into the opening closest to the wall on the receiver; use hammer or mallet if necessary to fit it in place. Then, attach the second tube receiver—or an end bracket that allows you to combine modular shelves to span longer than 73″—on the right end, and extend the tube with its receiver to reach the opposite wall. Before you repeat installation there, make certain that both the tube and tube receiver are level: The tube should be perfectly horizontal and the tube receiver should be level front to back along the sidewall. After both receivers and the back tube are in place, insert and expand the remaining four steel tubes to fit. Finally, mount the center support to the back wall, and then insert the hanging rod. Twist the rod so it expands to fit snugly in your space, and the first of your closet organizers is good to go! Step 4: Put up bracket shelves. Installation of shelves shorter than the full width of a wall (say, those meant to hang a small selection of pants beneath a collection of dresses, shirts, jackets, and more) is accomplished similarly to the easy process described in Step 3, but these short shelves attach to the back wall with at least one end bracket. So, rather than installing an end-to-end configuration between sidewalls, you’ll use the included template to help you fasten an end bracket and tube receiver assembly to the back wall, then attach the back tube and extend it out toward the sidewall, where you’ll insert it into the end bracket/tube receiver assembly. Then, you just need to add a center support and the hanging tube. Sound like a snap? It is! To see how easy, check out the installation videos. Step 5: Arrange the remaining shelves. The Expandable Walk-In Closet Organizer includes five shelf-and-rod units along with all necessary tube receivers for sidewall mounting and five center supports, as well as four end brackets to allow all the versatility you could possibly need. Customize your closet in a way that’s just right for your stuff and your space. For instance, in a “U”-shaped closet you could install double hanging on the left and right sides and a single hanging for long garments on the back wall. Or, if your space is large enough, you can purchase and install an extra stack of three to five expandable shelves (without the hanging rods) on one wall at whatever heights work best for storage of folded items like sweaters and short sleeve shirts or bins of accessories. Place these shelves anywhere you like without fussing over finding wall studs, and rest assured that the shelves will hold up to 200 pounds each. Step 6: Let it grow! Unlike other shelving, EZ Shelf is modular, so you can expand your walk-in closet in different combinations to fit your changing needs. Add more shelves as needed, connect shelves to one another to create storage longer than 73 inches, or—if you have a shelf left over—install it in another room that could use some durable storage. 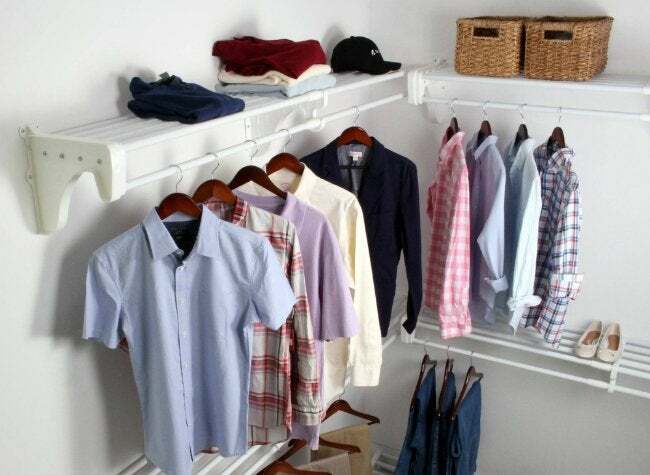 EZ Shelf products even work great as laundry room shelving or mudroom organizers! Step 7: Personalize and decorate. Take a few minutes to make your walk-in closet a truly unique, luxurious retreat. First, stack wicker baskets (or, for better visibility of contents, choose wire baskets or clear bins) atop high shelves to organize out-of-season accessories. Then, consider stationing an Expandable Shoe Rack in a bit of open floor space so your footwear will always be organized and in reach. A full-length mirror on the door and a few decorative touches, and you’re done. With a walk-in closet so great, you may never wish to walk out!